First off, let me be clear about one thing: multiphysics is useful to all engineers regardless of their knowledge of theory. This is a fact demonstrated by the wide user-base of COMSOL Multiphysics. So if you don’t have a taste for equations, no problem. Just use the physics putting the material properties and other governing parameters that you’re used to. The equations will still be there, behind the scenes and doing their work, but you don’t have to worry about them. I like to use the analogy of a car: most of us just drive it. Still, there is a segment of the population that can open the hood of a car, understand the technology, and achieve optimized performance by making changes. Now, for those who want to understand, in broad terms, what makes COMSOL Multiphysics special “under the hood”, read on. COMSOL Multiphysics is often thought of as a finite element method (FEM) code. Indeed it should be, since that is the primary method employed by COMSOL. However, the way COMSOL Multiphysics implements this to perform finite element analysis (FEA) is so clever that we patented it. Traditional FEA focuses on “elements”. These are fixed discretizations, usually associated with a mesh, that describe certain physics or combinations of physics. If you want to analyze a combination of physics for which no elements have been created (a priori) you either have to couple multiple solvers or you’re out of luck. COMSOL, on the other hand, first allows the user to combine physics in any way. (You can think of writing down any system of equations you want.) Then, just before solving, COMSOL initiates discretization “on-the-fly”. So really, it’s like having an infinite number of “element” types. 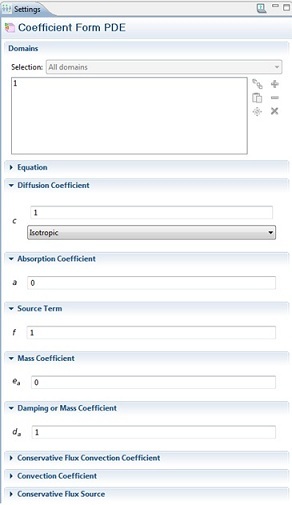 The Coefficient Form Settings Window. The Coefficient Form is one of the ways in which equations can be freely entered into COMSOL Multiphysics. What’s the benefit? Full flexibility in your modeling. That is why, when it comes to pioneering applications in multiphysics, COMSOL Multiphysics users have always come first. Just have a look through the COMSOL Conference papers and presentations, and you’ll see an incredibly broad range of combinations of physics and mathematical models. When you look at the big picture, there are even more benefits: a uniform workflow and the cross-pollination of innovative ideas, just to mention two. It is the patented multiphysics technology of COMSOL that makes this all possible, and will continue to provide a platform of innovation for computational scientists and engineers everywhere. I am conducting FEA on a nanocomposite in “Structural Mechanics -> Solid Mechanics (solid) -> Stationary”. I have to use a different equation from the default equation to solve the problem. So is it possible to change the default equation in the GUI it self rather than doing it on Live Link to Matlab extension ? Yes, all equations being solved in COMSOL can be edited by toggling on Show > Equation View in the Menu Window. You will then see the underlying equations being solved, as well as all derived variables. If desired, these can be edited by a user that wishes to take full control over the form of the governing equations.